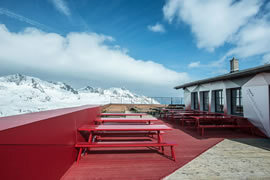 Mountain hut charm and the high-tech flair heartily shake hands with each other at 2,670m. 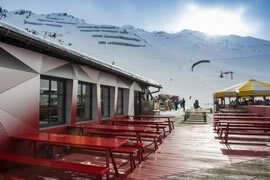 above sea level in Obergurgl – Hochgurgl. 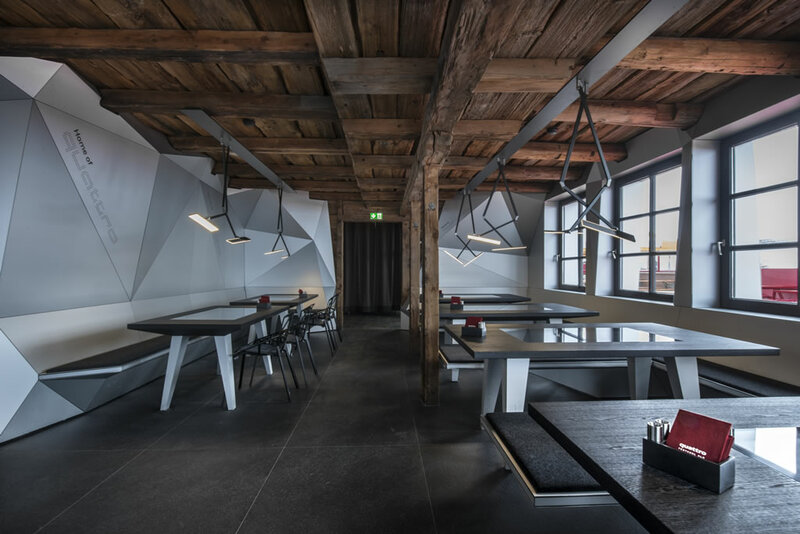 From cosy wood to matt anodized aluminium, from rustic to interactive – that is the Quattro Festkogl Alm. 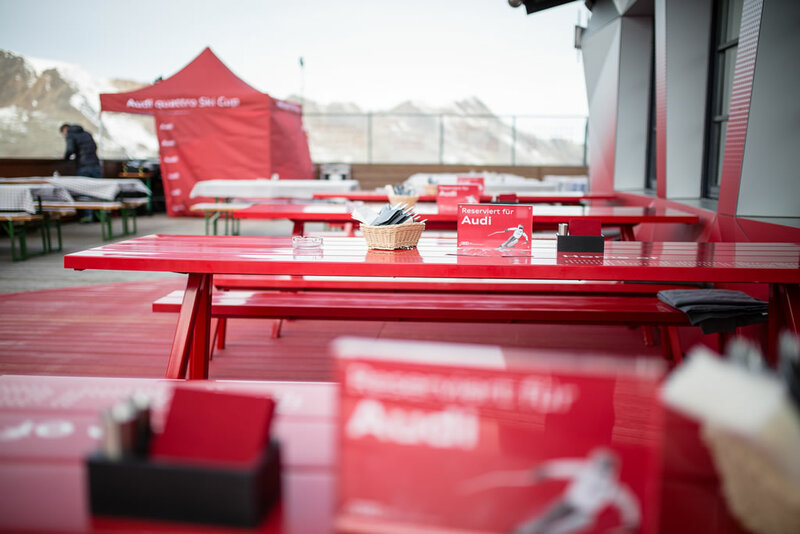 Overlooking the Gurgl glacier world, Audi Quattro becomes a tangible experience. 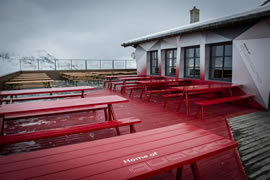 A red spot lights up amidst the firm, light snow. 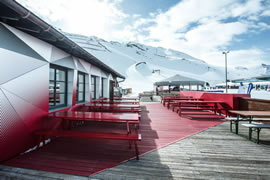 The snow is guaranteed for skiers and snowboarders up in the extremely high location and makes a reliable contrast to the red eye-catcher. 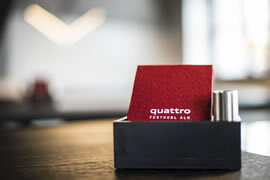 After an extensive free-ride session at the Quattro Festkogl Alm toasting hot beverages and savoury food are there to entice you. With this splash of colour as a goal in front of your eyes, exhausted skiers happily summons their last remaining burst of energy. 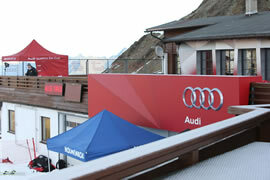 Whoever comes closer, will discover the red parapet element, which is the very familiar 4 rings. 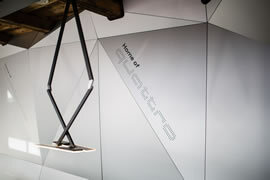 From this visual welcome sign, a modern design momentum blazes its way through an otherwise rustic mountain hut. 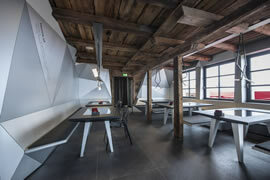 From the parapet over the sun terrace to the interior, a burst of colour and geometric forms spread out. 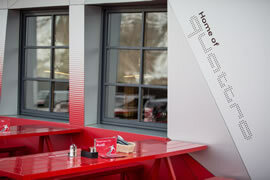 Materials that are useful in automotive lightweight harmonise with the elegant wooden facade. 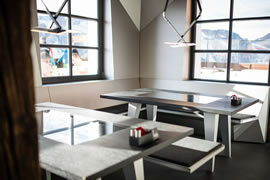 The different elements combine to form a strong duo of tradition and high-tech. Matt anodized aluminium is placed partially alongside the ancient walls and makes the lodge all the more an „It-Place“, with its superb views of the Gurgl glacier world. 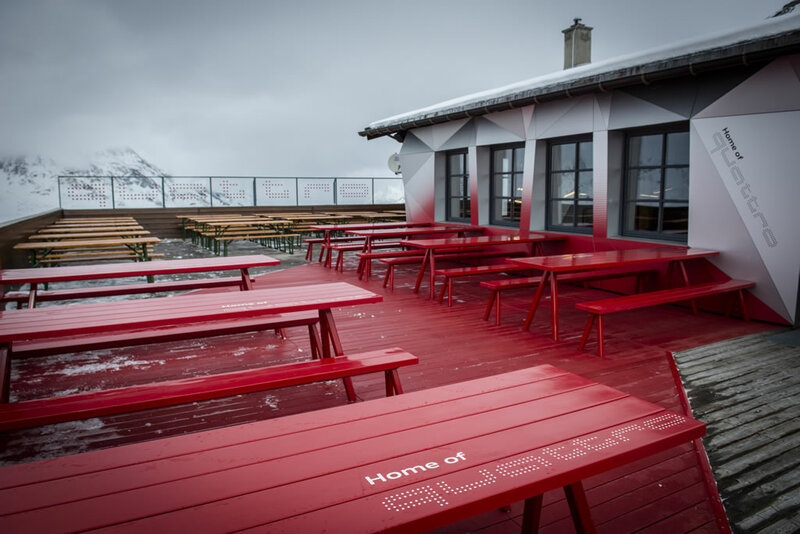 No wonder that skiing stars such as Nadine Wallner or Thomas Zangerl are often sitting here at the next table. 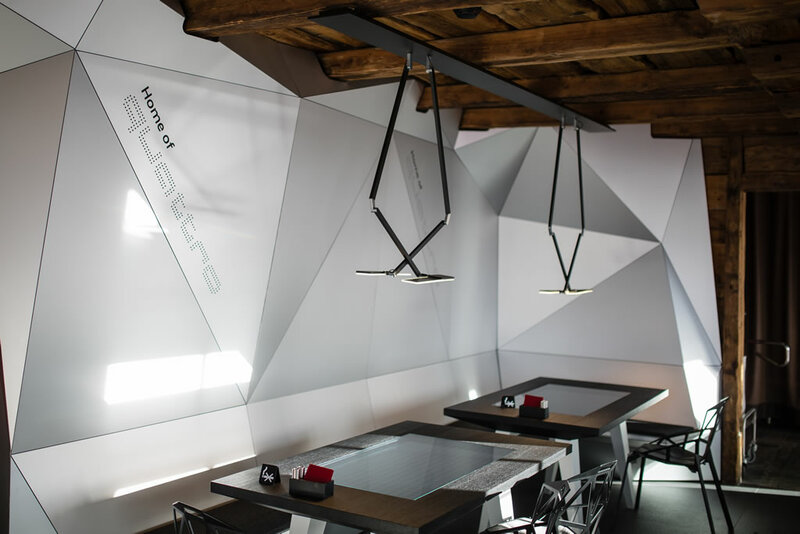 When the people at this next table – whether celebrities or not – are tapping their fingers on the table, this is not an indication of sunstroke. 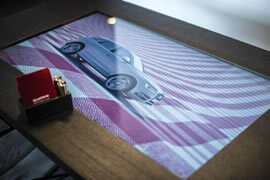 The red and white gingham tablecloth is digital and activated when an interactive tool is touched. 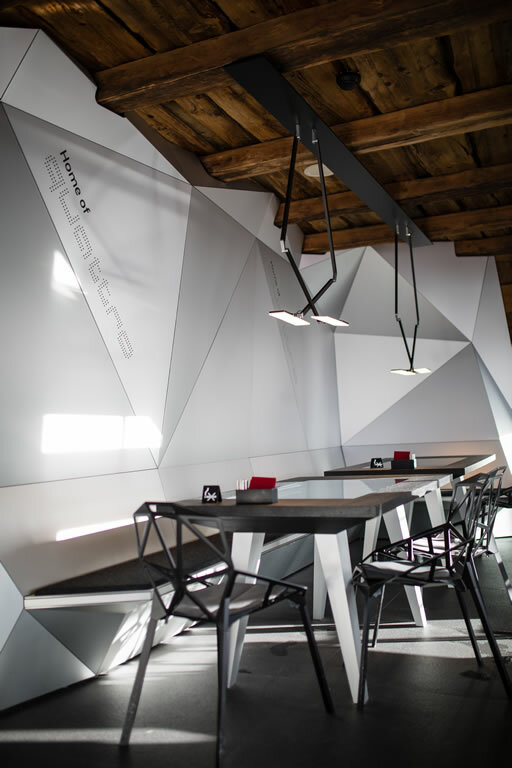 By touchscreen, visitors can manoeuvre around here for ski runs, weather forecasts and many clips by Audi Quattro. 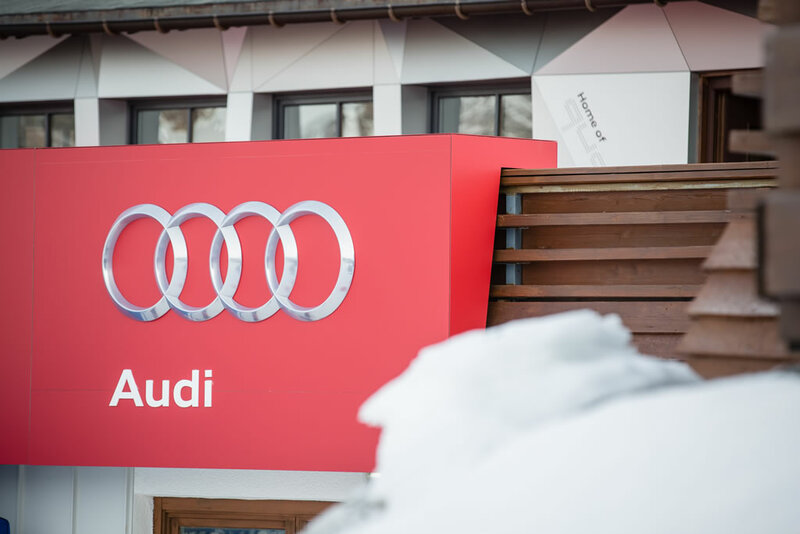 The traditional ambience of cosy alpine environment is thus electrified by the high-tech design of the Audi world. 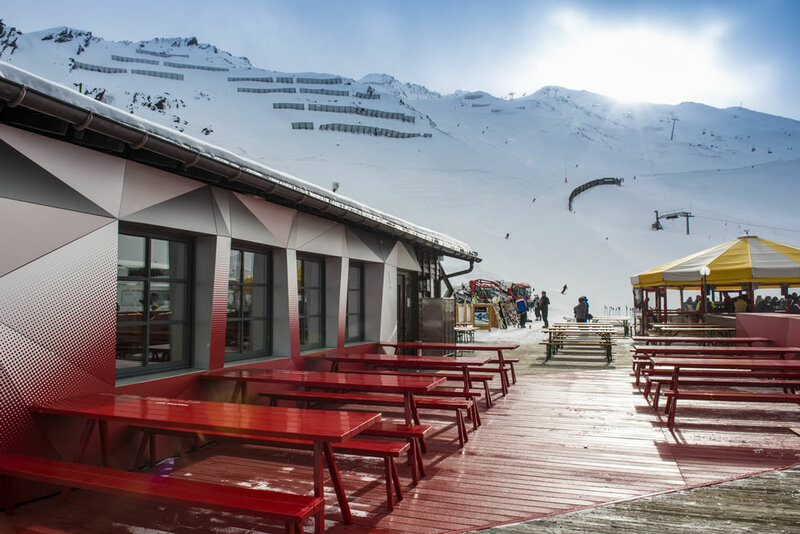 Through transformed and untransformed mountain hut areas, both spirits remain today, respecting life, and join forces in an irresistible parallel lifestyle. 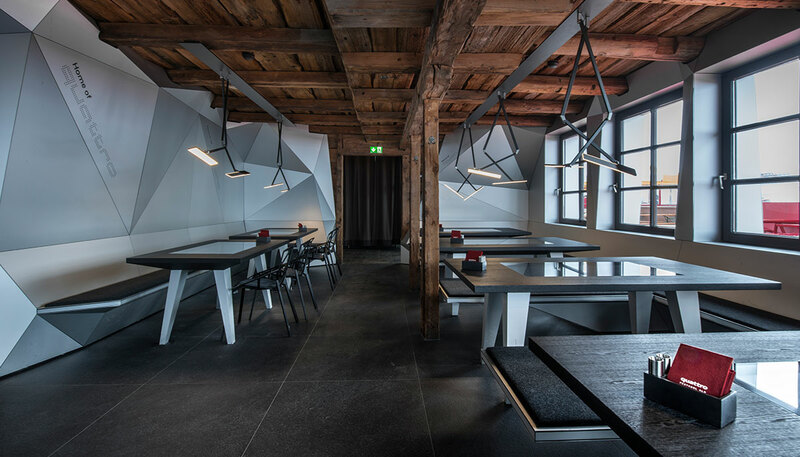 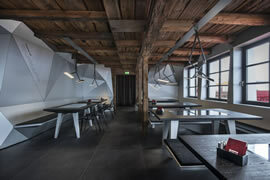 Together with the lift company of Obergurgl and the Munich-based Creative Office Designliga, this feeling of relaxed harmony between tradition and future technology expression has been achieved. 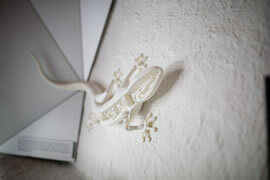 In this successful unit also stands the great 3D gecko, instead of a deer’s antlers, hanging above the fireplace. The renowned symbol of the intelligent Quattro drive thus accompanies every mountain party. 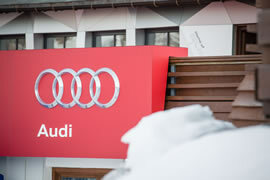 Have fun in the midst of ice and snow, consume hearty delicacies and experience Audi Quattro – that’s a drive. 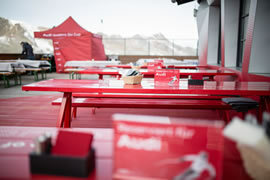 That’s the Quattro Festkogl Alm.